Photo Credit: Sherry Voth Photographic Design Ltd.
Vanessa Monar Enweani enjoyed a great deal of success in track and field events as a student at Holy Cross in Saskatoon, winning nine medals at provincial championships. Her best showing was in 1987, her senior year, when she won gold in the 100m sprint, long jump, triple jump, and high jump, setting provincial records in the latter two events. She joined the University of Saskatchewan’s track & field team the following year. During her years as a Huskie, Enweani was named a Canada West Conference All-Star three times. Over four Conference Championships, she won a total of seven medals. Four of those were in long jump, including gold in both 1990 and 1993. 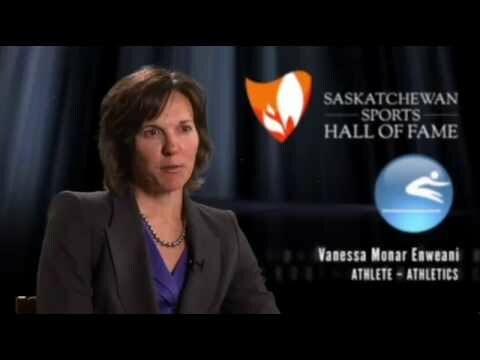 In 1990, she won the Ethel Catherwood Award as the most outstanding female athlete at the U of S. She would qualify for the Canadian Interuniversity Athletic Union’s National Championships three times, winning two silver medals in 1990, and a gold in the long jump in 1992. While still a student, Enweani qualified to compete in the Universiade (World University Games) in 1989 and 1993. In 1993, she won silver in the long jump. While she did not qualify for the finals in 1989, she did meet her future husband (and fellow Saskatchewan Sports Hall of Fame Inductee) Cyprian Enweani at that competition. Enweani stayed with athletics after her time at the U of S ended. From 1988 to 2000, she competed in the long jump at ten Canadian Outdoor Senior Championships. At those ten championships, she won two bronze medals, four silvers, and four golds. In the year 1999, she recorded the six best performances by any Canadian woman in long jump. That same year, she was a finalist for the Sask Sport female athlete of the year. Enweani had the opportunity to compete internationally as well, at events such as the 1998 Commonwealth Games, and the 1999 Pan-American Games. Her best finish at an international event came in the 1997 Francophone Games, winning the gold medal. Since retiring from competition, Enweani has served on the board of directors for the 1989 Jeux Canada Games Foundation and as a spokesperson for KidSport.